Put butter and sugar in a saucepan, add fruit rinds and juice. Heat gently for 2-3 minutes, stirring occasionally until the butter has melted and the sugar dissolved. Pour mixture in a basin (for lack of another vehicle I found that one of my small cooking pans balanced quite nicely in the basin, resting on the handles against the sides of the slow cooker bowl without touching bottom) that will fit comfortably in your slow cooker pot, leave to cool for 10 minutes, add the eggs and mix well. Cover the basin with foil, put foil straps or a string pudding bowl lifter in the slow cooker pot and place the basin on top. Pour hot water into the cooker pot to come halfway up the sides of the basin. Add the cooker lid and cook on "low" for 3-4 hours until the mixture is very thick. Stir once or twice during cooking if possible. Warm 2 clean jars in the bottom of a low oven and spoon in the citrus curd, place a waxed disc on and leave to cool. Seal each jar with a screw-top lid, label and store in the fridge. Use within 3-4 weeks. Verdict: it's very good, nice and tangy, velvety smooth and it worked surprisingly well. I had my doubts about the cooking time, (I mean, honestly, how long does it take to cook lemon curd by yourself?) but I can see it's nice to make this while you can do all kinds of other chores around the house, no stirring, no fear of curdling. The idea of throw everything together and wait till it's finished is very tempting. Comes in the Mother's day present... 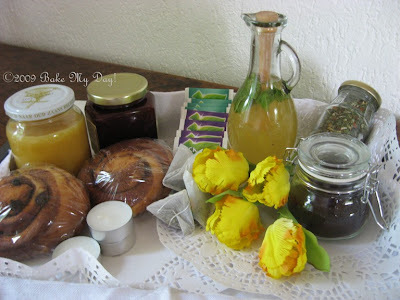 This year I made a "breakfast tray", a jar of home-made lemon curd, a jar home made strawberry jam, freshly ground coffee, some tea samples, home made cinnamon rolls, candles, a bottle home made mint infused lemon cordial, and a cornbread that is not on the pic yet because it's still cooling... (re: the empty spot on the front), I think I might add a small bottle of prosecco! Makes me miss my mom. Makes me wish I had a daughter. It's really beautiful! Yes, that empty spot is crying for prosecco!! ;o) peanut butter and mayo is strange sounding but a surprisingly wonderful taste - it's that tart sweet thingie. So I'm strange. What a beautiful selection of food! It all looks delicious. You are making some interesting things with your slow cooker! Love, love, love the new look!!! Great job! Fijne (late) moederdag nog!! What a beautiful brunch tray! 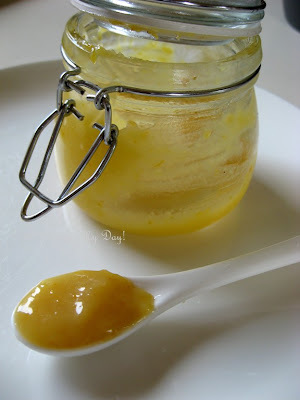 And who knew you could make lemon curd in the slow cooker? Genius! Curds and dials. Both my weak spot. Love the mother's day tray. Beautiful. That's a lovely tray. My mother in law makes a microwave lemon curd that is pretty good - I'd never heard of slow cooker curd! * Jenni, ik weet het... elke keer denk ik: nu moet het ook in het nederlands... en twijfel ik, wordt dan mijn post niet te lang, leest iemand het nederlands wel? I know I would love to receive a tray like this! Beautiful!